First, let me just say that I have tremendous respect for the guys at HedgEye. They are insightful and thoughtful in their analysis and well worth your time to read. 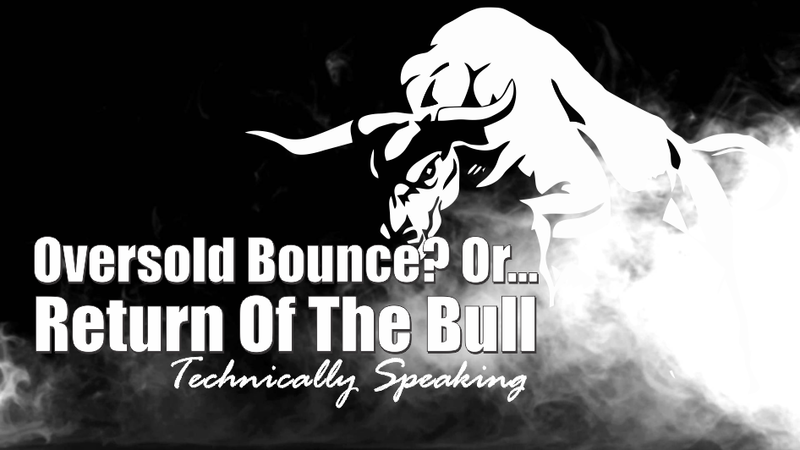 However, a recent article by HedgEye made a very interesting point that bears discussion. Valuations are not a catalyst. If you “overpay” for something today, the future net return will be lower than if you had paid a discount for it. Think about housing prices for a moment as shown in the chart below. There are two things to take away from the chart above in relation to valuation models. 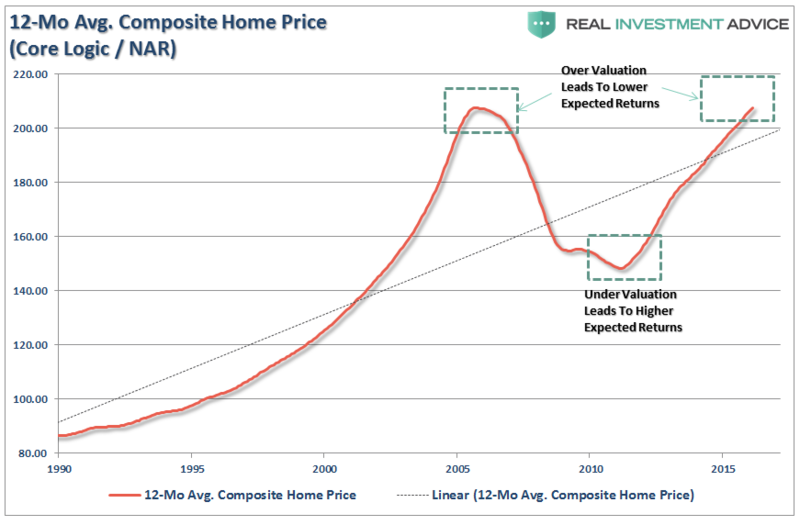 The first is that if a home was purchased at any time (and not sold) when the average 12-month price was above the long-term linear trend, the forward annualized returns were significantly worse than if the home was purchased below that trend. Secondly, if a home was purchased near the peak in valuations, forward returns are likely to be extremely low, if not negative, for a very long time. This is the same with the financial markets. 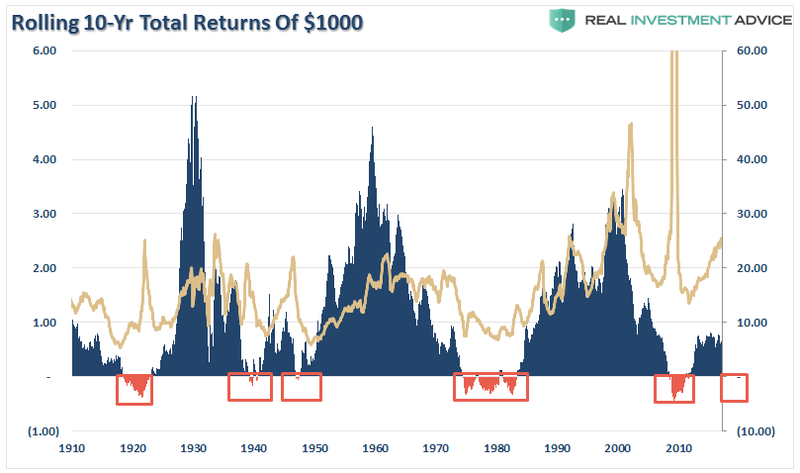 When investors “pay” too much for an investment, future returns will suffer. “Buy cheap and sell dear” is not just some Wall Street slogan printed on a coffee mug, but a reality of virtually all of the great investors of our time in some form or another. 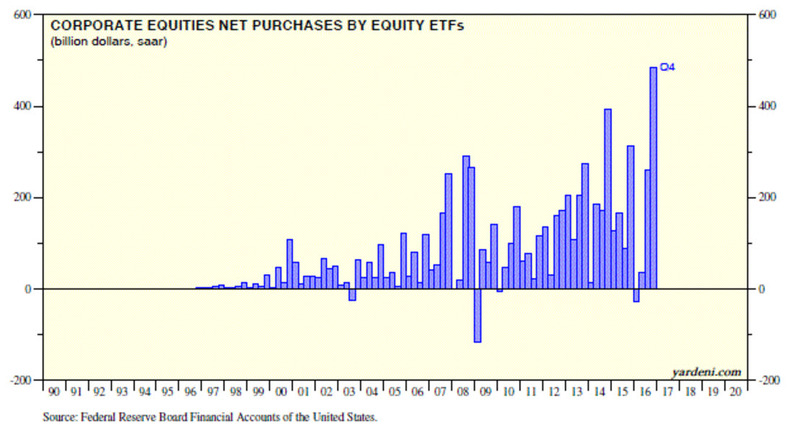 While, Wade is correct that investors who got out of the market using Shiller’s P/E ratio would have missed the run in the markets from 2009 to present, those same individuals most likely sold at the bottom of the market in 2008 and only recently began to return as shown by net equity inflows below. In other words, they missed the “run up” anyway. Investor psychology has more to do with long-term investment outcomes than just about anything else. What valuations tell us, is that at current levels investors are strictly betting on there always being someone to pay more in the future for an asset than they paid today. It is not surprising that due to the elevated level of P/E ratios since the turn of the century, which have been fostered by one financial bubble after the next due to Federal Reserve interventions, there has been a growing chorus of views suggesting that valuations are no longer as relevant. There is also the issue of the expanded use of forward operating earnings. First, it is true that P/E’s have been higher over the last decade due to the aberration in prices versus earnings leading up to the 2000 peak. However, as shown in the chart below, the “reversion” process of that excessive overvaluation is still underway. It is likely the next mean reverting event will complete this process. Cliff directly addressed the issue of the abuse of forward operating earnings. Ed Yardeni published the two following charts which shows analysts are always overly optimistic in their estimates. “This is why using forward earnings estimates as a valuation metric is so incredibly flawed – as the estimates are always overly optimistic roughly 33% on average. 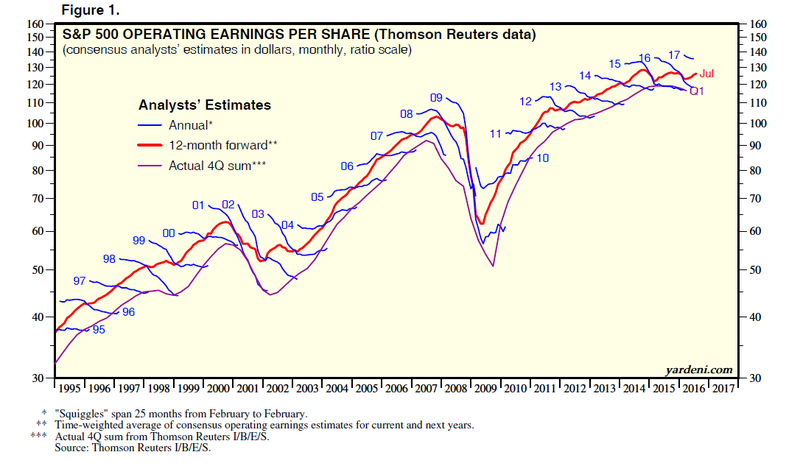 Furthermore, the reason that earnings only grew at 6% over the last 25 years is because the companies that make up the stock market are a reflection of real economic growth. Stocks cannot outgrow the economy in the long term…remember that. Currently, there is clear evidence that future expectations should be significantly lower than the long-term historical averages. Do current valuation levels suggest you should be all in cash? No. However, it does suggest that a more cautious stance to equity allocations and increased risk management will likely offset much of the next “reversion” when it occurs. My job is to protect investment capital from major market reversions and meet investment returns anchored to retirement planning projections. Not paying attention to rising investment risks, or adjusting for lower expected future returns, are detrimental to both of those objectives. Next week, I will introduce a modified version of the Shiller CAPE ratio which is more constructive for shorter-term outlooks.